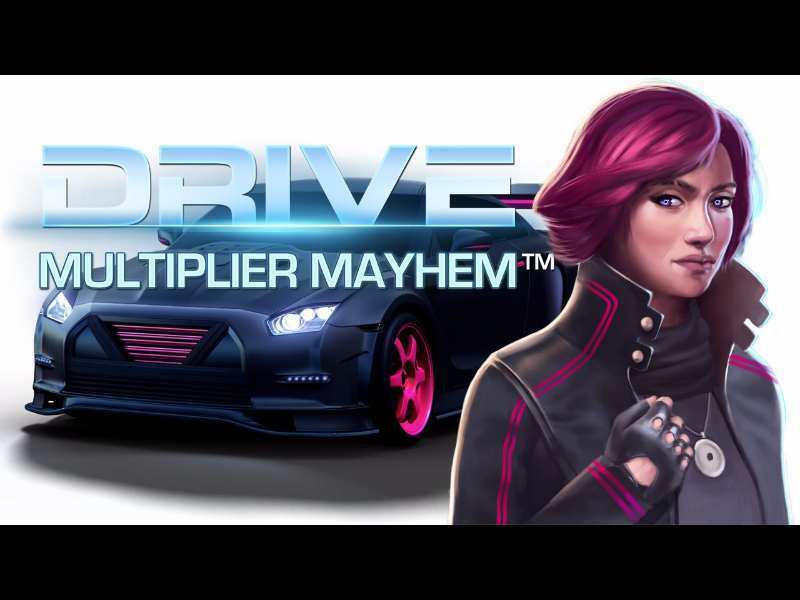 The Drive: Multiplier Mayhem is an online creation made by the Famous NetEnt game producer. This is a real adrenalin rush casino machine with hot wheels and lots of mega jackpot payouts. It possesses a standard 5 reel table with 15 fixed pay lines. The Drive: Multiplier Mayhem is a race-themed casino machine with lots of driver symbols and fast cars. This is a two version online slot game. For gamblers who just want to have fun in the UK from other countries with no download required there is a fun mode play. More serious bettors can test the real money version (available only for gamers who are above 18 years old). When the desired version is selected, players can now set some of the main configurations for easier and more comfortable betting. To start gambling, the player can press the “Spin” button. Wheel spinning can be stopped by force if a gambler clicks the button again and this will have no influence on the outcome. The NetEnt developer provided the “Autoplay” button. By clicking on it, players can adjust the number of consecutive rounds by choosing the desired number. There are also advanced settings for this option where bettors can set when the auto rolls will stop automatically like in a case if free spins are won. Gamers can increase their bets by simply clicking on the “Level” mark (from 1 to 10). This will determine the total bet for a single round. For more stakes adjustments, players have an option to change the coin value. If a gambler wants to set the wager to the maximum, the “Max Button” can found at the main menu. All payouts will be gained looking from left to the right side of a gambling display. For more info, players can search the “Info” table where all conditions, features, and symbols are explained. Wild and Multiplier – in most games these cards have separate functions. In the Drive: Multiplier Mayhem online, they can be used for double benefits. When this icon is found anywhere on reels from 1 to 5 it will provide the corresponding reel multiplier. So if for an example, a gambler finds a wild card on the fourth reel, the multiplier will be 4 times and so on. This card can substitute any sing except for the scatter and nitro icons. In a case that 2 or more of these symbols show up on a winning line, multipliers will be multiplied too. Scatter – this is a special symbol that can be used for free spins but with one unique way of rolling. When 3 or more signs are gathered on reels 2, 3 and 4, players will receive extra rounds and overlay multiplier wilds. These wilds will randomly pop out on a table but only one for a single spin. This is also a bonus fun game where bettors will get a chance to race and finish 4 levels. In each of those levels, the different driver will wait for a gambler to have a one on one race battle. The goal is to get 3 nitro signs for each level to progress further and score more money. The more drivers a player beats, more free rounds he/she will gain. The Drive: Multiplier Mayhem offers a totally new way to spin the wheel with extra levels and a unique free bonus feature. This is not just for fun. Extra cards can bring lots of big cash rewards. To increase the odds of winning, players can simply try to bet longer. This can actually be accomplished easily using special bonus signs. This is the best way to gain prizes. Triggering the special bonus race feature can improve winning chances multiple times. The more free rounds are won, the higher are the odds that a gambler will accumulate more cash during that time. Bettors can win huge jackpot cash prizes while they play free Drive: Multiplier Mayhem casino slot machine in no time just by setting the stakes to the maximum amount. Gamblers can play the Drive: Multiplier Mayhem online slot via multiple devices and gain a big stack of cash. This is a unique slot game that provides not just big scoring possibilities but also a fun way to spin the wheel. Race, spin and score real money rewards. 0 responses to "Drive: Multiplier Mayhem Slot"